1. Properly secure the child seat to the vehicle. All child seats must be secured to the vehicle with the lap part of a lap/shoulder belt or with the LATCH (lower anchors and tethers for children) system. A child whose seat is not properly secured to the vehicle can be endangered in a crash. 2. Make sure the child seat is firmly secured. 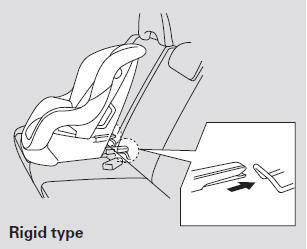 After installing a child seat, push and pull the seat forward and from side-to-side to verify that it is secure. A child seat secured with a seat belt should be installed as firmly as possible. However, it does not need to be ‘‘rock solid.’’ Some side-to-side movement can be expected and should not reduce the child seat’s effectiveness. If the child seat is not secure, try installing it in a different seating position, or use a different style of child seat that can be firmly secured. 3. Secure the child in the child seat. Make sure the child is properly strapped in the child seat according to the child seat maker’s instructions. A child who is not properly secured in a child seat can be seriously injured in a crash. The following pages provide guidelines on how to properly install a child seat. 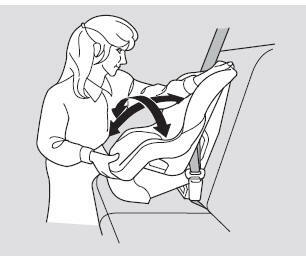 A forward-facing child seat is used in all examples, but the instructions are the same for rearfacing child seats. 5. 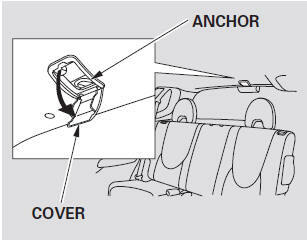 Route the tether strap over the seat-back and through the head restraint legs. 6. 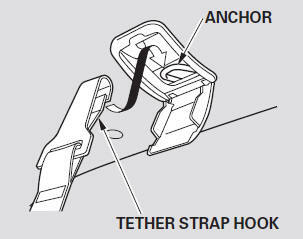 Attach the tether strap hook to the anchor, making sure the strap is not twisted. When not using the LATCH system, all child seats must be secured to the vehicle with the lap part of a lap/ shoulder belt.In addition, the lap/shoulder belts in all seating positions except the driver’s have a lockable retractor that must be activated to secure a child seat. 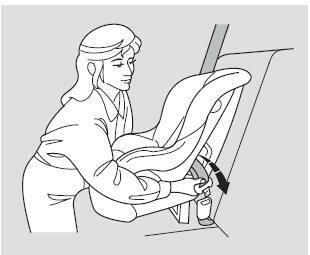 If you intend to install a child seat in the center seating position of the rear seat, remove its head restraint, and make sure the detachable seat belt is securely latched. 1. 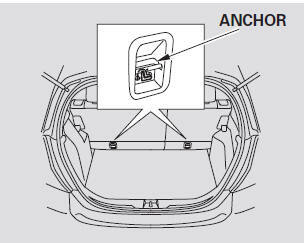 With the child seat in the desired seating position, route the belt through the child seat according to the seat maker’s instructions, then insert the latch plate into the buckle. 2. 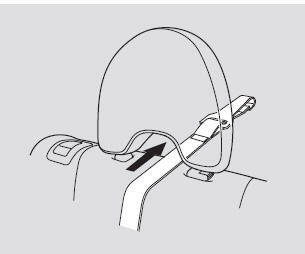 To activate the lockable retractor, slowly pull the shoulder part of the belt all the way out until it stops, then let the belt feed back into the retractor. 3. After the belt has retracted, tug on it. If the belt is locked, you will not be able to pull it out. If you can pull the belt out, it is not locked, and you will need to repeat these steps. 4. 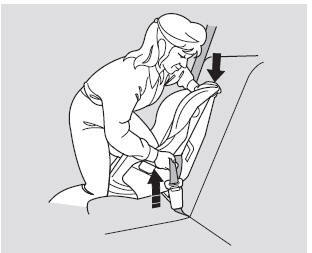 After confirming that the belt is locked, grab the shoulder part of the belt near the buckle, and pull up to remove any slack from the lap part of the belt. 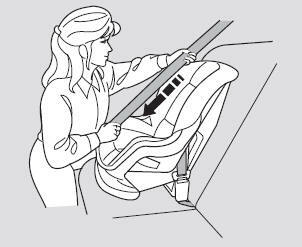 Remember, if the lap part of the belt is not tight, the child seat will not be secure. To remove slack, it may help to put weight on the child seat, or push on the back of the seat while pulling up on the belt. 5. Push and pull the child seat forward and from side-to-side to verify that it is secure enough to stay upright during normal driving maneuvers. 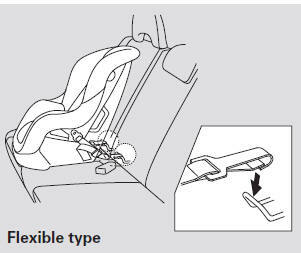 If the child seat is not secure, unlatch the belt, allow it to retract fully, then repeat these steps. To deactivate the lockable retractor and remove a child seat, unlatch the buckle, unroute the seat belt, and let the belt fully retract. 1. 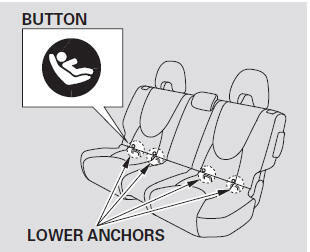 After properly securing the child seat, route the tether strap over the seat-back and through the head restraint legs. 2. 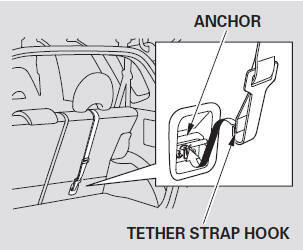 Attach the tether strap hook to the anchor, making sure the tether strap is not twisted. 1. Remove the rear center head restraint, and store it in a safe place. 4. 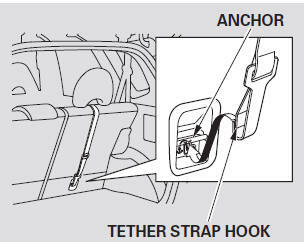 Route the tether strap over the seat-back, then attach the tether strap hook to the anchor, making sure the tether strap is not twisted. When a child reaches the recommended weight or height limit for a forward-facing child seat, the child should sit in a back seat on a booster seat and wear a lap/shoulder belt.